It took 4 days before I realized that this Jeep was not black, but green. “Black Forest Green,” to be exact, a shade so elusive that it only reveals its verdance in direct sunlight. Unlike its paint – which has a visual sweet spot about one millimeter wide – the Grand Cherokee’s sweet spot is a mile wide. Here’s a do-everything SUV from a company that still has the guts to offer it with a spanking V8. In fact, you can optionally order not only the 360hp, 5.7 liter V-8 of our test Jeep, but also a 6.4 liter V-8 which produces 470hp in the SRT8 model. For those of you more concerned with economy than performance, Jeep’s base motor for the Grand Cherokee is a 3.6 liter V-6 good for 290hp, as well as a just-introduced 3 liter diesel which makes 240hp, 420 lb.ft. of torque, and returns 28 MPG. Although combined city/highway fuel economy of the 5.7 liter V-8 is a modest 15 MPG, this engine, coupled to a 6-speed automatic, is a perfect match for the Cherokee’s 4,470 lb. curb weight. The V-8 option adds $2,195 to the Jeep’s $43,595 base price. But the engine upgrade also includes a bevy of valuable extras that are essential if you plan to tow: 220 amp alternator, heavy duty ABS disc brakes, heavy duty engine cooling, and trailer tow group IV, which includes hitch and wiring. Another worthy option included on our test Jeep is the electronic limited slip rear differential ($695) which overcomes traction loss in the standard Quadra-Drive II 4WD system. The underpinnings of this Jeep match the sophistication of much more expensive SUVs like Rover’s Range Rover, and Volkswagen’s Touareg. One simple control dial located on the center console enables you to adjust the ride height and traction algorithm for any road condition from smooth tarmac to rough Rubicon Trail. This “Selec-Terrain System,” standard on the Overland Cherokee, covers all the bases from “Rock” to “Sand/Mud” to “Snow” and “Sport.” There’s also an intermediate position labeled “Auto” which lets the Cherokee decide what’s appropriate for given conditions. Standard 4 corner “Quadra-Lift Air Suspension” handles the detail work, although you can manually control ride-height as well from that same single control dial. 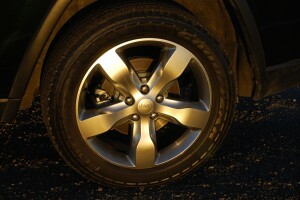 Purposeful Goodyear Fortera HL M&S rated tires (265/50R20) do a great job of interpreting your commands. On pavement, where this Cherokee will undoubtedly spend most of its time, the Goodyears, mounted on simple but handsome 5-spoke aluminum 8” x 20” alloys, are especially impressive at carving corners. 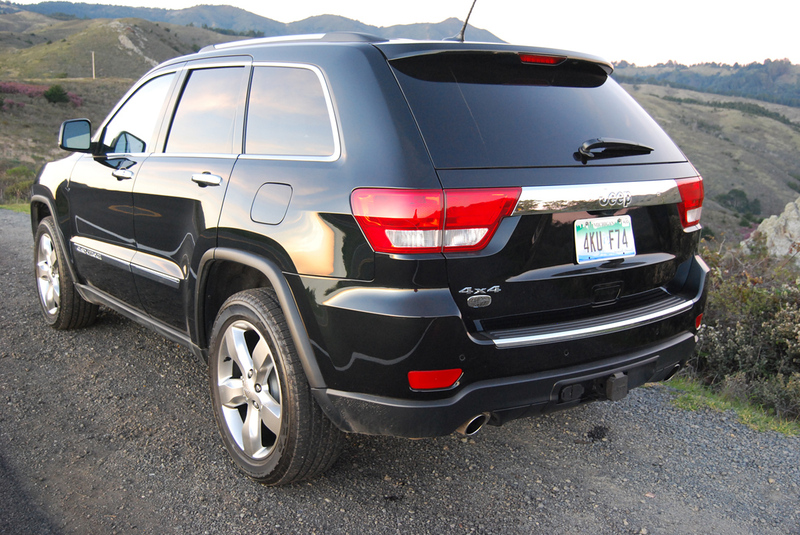 Though the Cherokee is tall and boxy, it never embarrasses itself in acceleration or handling. This performance sweet spot is nearly matched by its comfort profile. The host of standard luxury features is so complete that it matches offerings from Lexus (RX series) and puts to shame the overpriced option extravaganza you’ll encounter if you buy a BMW X5. For 2013, the Overland version adds Front Park Assist, headlight washers and folding exterior rear view mirrors to its lengthy list of standard items. Both front seats are leather trimmed with fastidious edge-welting and tone-on-tone “Overland” headrest embroidery. They are also heated and ventilated. The Fat-rimmed steering wheel, with its top arc done in simulated wood grain, heats instantly and stays warm indefinitely. Two women who drove this Jeep complained that the steering wheel rim was too fat for them but I loved it. Although both front seats are 8-way power adjustable, I could never achieve a fully satisfactory position because the backrest cushion always seemed too flat and hard. Surprisingly, even the rear seats are adjustable for rake, supplied with fold-down armrest mounted cup holders, and heated as well. Back seat passengers are given a pair of floor-mounted vent/heat outlets, and best of all, a splendid view through the standard “Dual-Pane Panoramic Sunroof” which aerates the interior like an aquarium. The tailgate is power-assisted, with key fob actuation, and the back seats collapse into themselves to form a flat load floor in mere seconds. 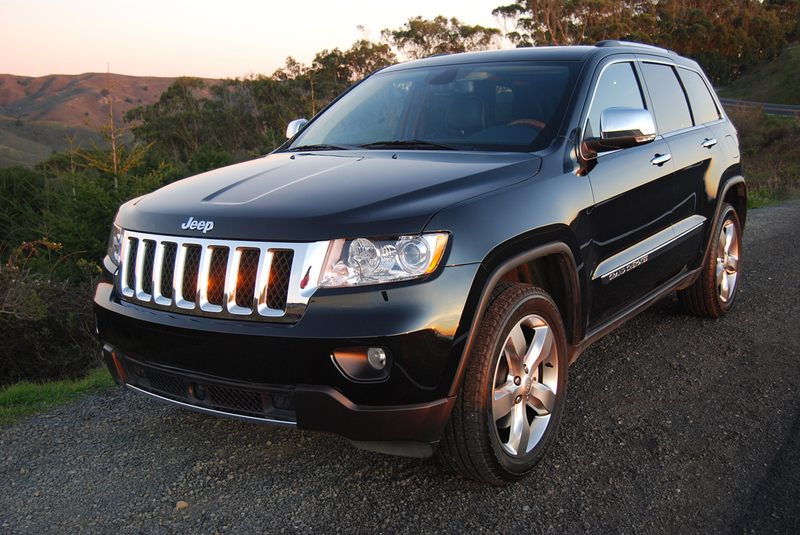 The Overland version of the Grand Cherokee is an all-around SUV category winner. It’s fast enough to keep you out of trouble in the passing lane, and adept enough at handling to surmount any terrain it encounters. Best of all it is well made, comfortable and eminently affordable considering all it offers. 2011 GMC Sierra 2500HD SLE Review – Got Trailer?